The Transition Movie Needs You! The Transition Movie: A Call For Creative People! In the spirit of collaborative working that sits at the heart of the Transition movement, we are planning “The Transition Movie” as a 50 minute broadcast-quality documentary which reflects the movement itself. We are inviting people involved in Transition Initiatives to share their successes, failures and extraordinary events and breakthroughs through the medium of film, in other words we need you. We want to unleash the amateur film makers out there in Transition-land who can capture the goings-on in their area, finding people who have the stories to tell, whose lives have been changed, whose directions have shifted and who find that Transition has touched their lives in unexpected ways. 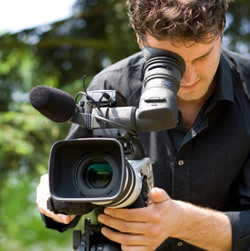 Film makers will ideally have a digital camera which is good enough quality to be broadcast – i.e. DV – begged, owned or borrowed, however, we are also keen that the film celebrates the possibilities of new media, so if nothing else comes to hand, even a good mobile phone could yield useful footage! This is, like much that happens in Transition projects, a to–be-done-in-your-own–time, not financially reimbursed, labour of love! But you will of course get a credit at the end of the film and a copy of the DVD hot off the press (or whatever DVDs come off…) as well as an astonishing degree of fame and prestige and general smugness. We will arrange two Training Days around the UK (to be announced) where you can get hands on training from experienced film makers Chris Watson and Emma Goude, who are editing the final film. These will be free. Chris and Emma will continue to act as mentors after the training. We will also supply the tapes and postage for you to send the footage back to the editor. We have set up a Film-makers’ Basics section here, with useful films, tips and links. Within the documentary we want to tell the stories of the various initiatives and show what’s happening both in the UK and internationally. We really want to show the regional variations and how Transition might differ in your area. What is a Japanese Unleashing like? What does Open Space look like in Aberdeen? We would like to show stories from around the country that will engage an audience. These will be inspiring and show the heroic attributes required to work against the odds to turn something around. They will show a person’s journey to take action and how that challenges their comfort zone and leads them to hone new skills for the adventure. We would like you to find people who are involved in a specific project that will give the film a sense of development, transition even, from the beginning of October to the end of December 2008. What ends up in the final movie will all depend on the quality of what comes in to the edit. Before you send us the footage, you will have looked through it and time coded the best bits so that we can edit more economically. The stories need to be happening NOW and not already happened or going to happen in 6 months time. So for example we might film someone struggling to grow food over the winter in a garden share project in Totnes. Then we would cut to Lewes for example and see what the difficulties are in that area. As it’s for visual media, it needs to contain action. We don’t mean car chases! Just activity that is taking place – gardening, building, constructing a water wheel etc…a visual project that the audience will be able to SEE grows over time. We would like to find people from all walks of life – north, south; young, old, black, white; male, female; experienced and clueless. We are interested in the EMOTIONAL journey of the movement. The film needs to engage the audience, have them on the edge of their seats and finally uplift them so that they leave inspired to act themselves. We’re not asking for much!!! The film will not only help others who are just beginning to get a sense of what might be involved in being a Transition Pioneer but we also have an eye to pitch it to the BBC for national broadcast. This would massively increase the profile of the Transition Network. So, we will be approaching this from a highly professional point of view. We want this to be the best Transition film out there (as well as being the only one)! As TV budgets go, we don’t have a lot of money…which is why we can’t pay any film makers. We are also looking for composers, animators and graphic designers to give the film it’s emotional barometer and visual style. So any recent graduates or students out there who feel particularly impassioned to lend their skills in exchange for a credit at the end of the film are most welcomed. We would like to see your ‘showreels’. This is your film. If you would like to put yourself or someone you know forward please send us an email with a description of yourself, how you are involved in the Transition Network and what you see happening over the next 6 months. If you want to be the film maker/composer/graphic designer then please send us some samples of stuff that you have done. Finally, if you already have some footage out there from events that have already taken place in your area then we are keen to see this too. So please send it in and we will send you a form to sign if it gets into the finished programme. The Transition Movie will be premiered at the 2009 Transition Network conference at the Battersea Arts Centre, 22nd- 24th May 2009 (which is filling up fast).